A small sliver of the internet was recently sent into a tizzy over Tesla Motors CEO Elon Musk’s posting of a photo from his visit to the Ramen Jirō branch in Kabukichō. Concerned followers made an effort to explain to Musk that many do not consider Ramen Jirō to be ramen, just Jirō. Indeed, for something that has gained such cult status among its devoted acolytes, a visit to the original was the only way my first encounter was going to go down. 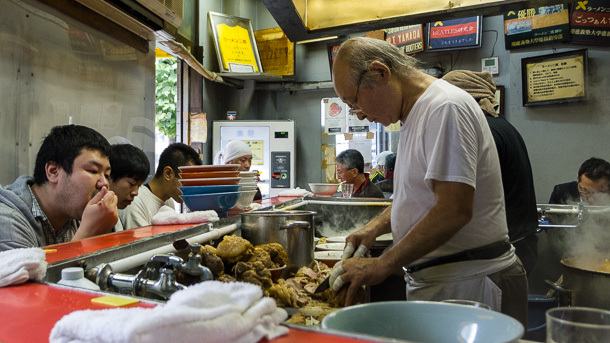 At the Ramen Jirō Mita honten (ラーメン二郎三田本店), other than brief words between friends before the bowls are served, diners sit and feast in quietude, as Ramen Jirō father Takumi Yamada cues up piles of ingredients and watches over his flock. 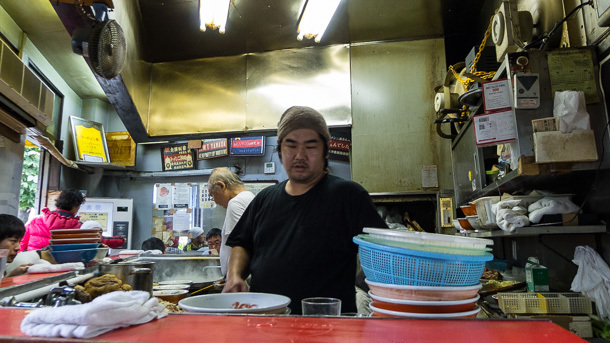 Yamada’s gift extends well beyond the many devoted years serving up massive portions from the Mita shop, which opened in 1968. Apprentices train under his guidance, then go on to open branches around the greater Tokyo area. 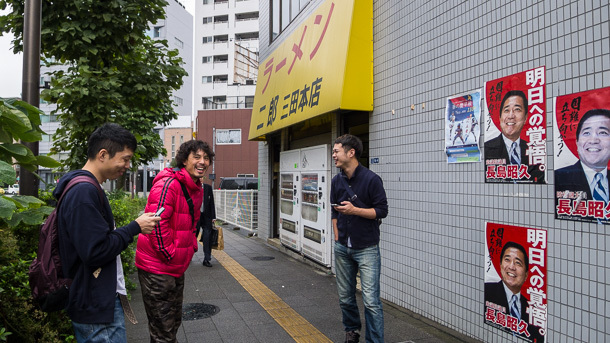 At last count, there were 33 shops carrying the Ramen Jirō name. I went just a little after the morning rush for a Jiro brunch. After moving through a very short queue I stepped up into the narrow wedge-shaped building, a minute or two later staring at the complete mess in front of me. This is Ramen Jirō. 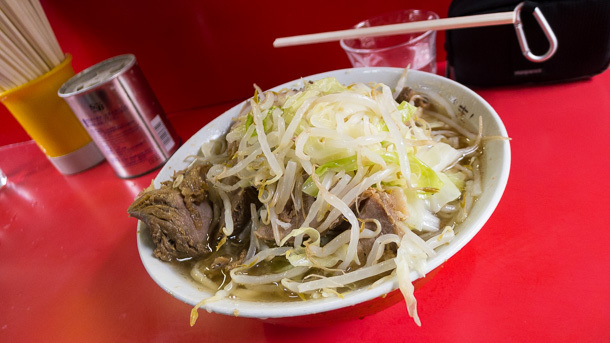 Thick noodles, chunky fatty pig flesh, and a mound of cabbage and bean sprouts, all just dumped in the bowl and soaked in a liquid that may have more suspended fat than it does water. It is glorious. There was only one point on which I felt a little cheated. As someone versed in the proper ordering parlance for Philadelphia cheesesteaks, I was all into the esoteric ordering ritual for which Jirō is famous. I had practiced my customizations in Japanese until I had them committed to memory and was all set to go when Yamada turned to me and asked, in perfect English, “You want garlic with that?” Foiled. I got my mound of garlic, but was so flustered I forgot to ask for karame, a special soy sauce-based seasoning. Next time, then. There is one other reason why a visit to this shop had particular meaning for me. Rameniac’s review of Ramen Jirō in Mita is a thoughtful write up of not just the shop, but of why it’s important to explore and share what we learn and experience. Rickmond Wong’s mini lecture advises would be food bloggers that, while the internet gives you the tools to share whatever you like, if you’re going to go to the trouble of blogging about your lunch, to make sure you have something meaningful to say. 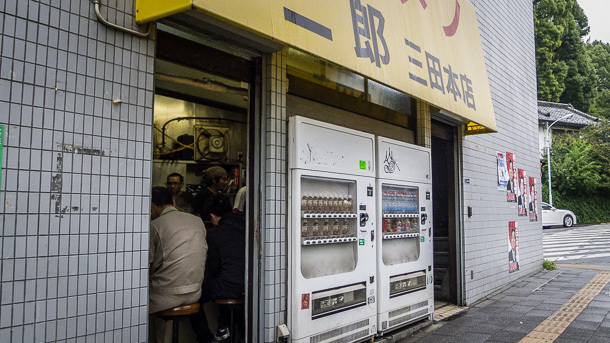 The call to thoughtful action was one of my inspirations to start walking Tokyo neighborhoods, photographing them and writing about them, and I refer back to it to this day. It’s also why you find these short posts about great little ramen shops sprinkled in between the photo essays on transit, neighborhoods and public space. As Yamada’s deshi dutifully carry on the Jirō name after they complete their apprenticeships, writing this post is my way of saying thanks for helping me find my way.